Readers might vaguely recall of a tale I told in the summer of 2011 when I heard a scanner call of a wildfire at our address. I drove home that day with both the purpose of covering it and to see if I might be homeless. What readers don’t know is that five years ago was not the first time it’s happened. Some of my neighbors from my downtown apartment watch as the Ada Fire Department works to extinguish the blaze at their home. Fortunately, no one was hurt, and they all got to move back in later that fall. From the time I moved to Ada to the day I got married, I lived in a small apartment in downtown Ada, Oklahoma. It suited my needs, and I particularly liked that I was within walking distance of a grocery store, my bank, the sub shop, a video rental story, and my office. Rent was very low, my landlord liked me, and I became friends with many of my neighbors, none of whom lived there for as long as I did, 16 years. Many of the people who lived there were college students, since it was close to the University and affordable. I am friends with some of those people on Facebook to this day. At about 11:55 a.m. on September 2, 1995, I was standing in the newsroom preparing to go home for lunch when I heard fire dispatch on the scanner say, “Apartment fire, 506 east 12th Street.” Hmm. My address. Oh, sh!t! That’s my address! I drove home as calmly as I could; I’ve always been able to keep fairly calm in crisis situations. Fortunately, that drive is less than two minutes, and I arrived just as the fire department did, to see thick grey smoke belching from the building across the breezeway from my own. Whew. It turned out that one of my neighbors, a friend, had left a stove burner on and left for work, a mistake any of us could make. Ada Fire got it suppressed quickly, and no one was hurt. Our landlord, SON Properties, repaired the damage within a couple of months, and everyone moved back in. 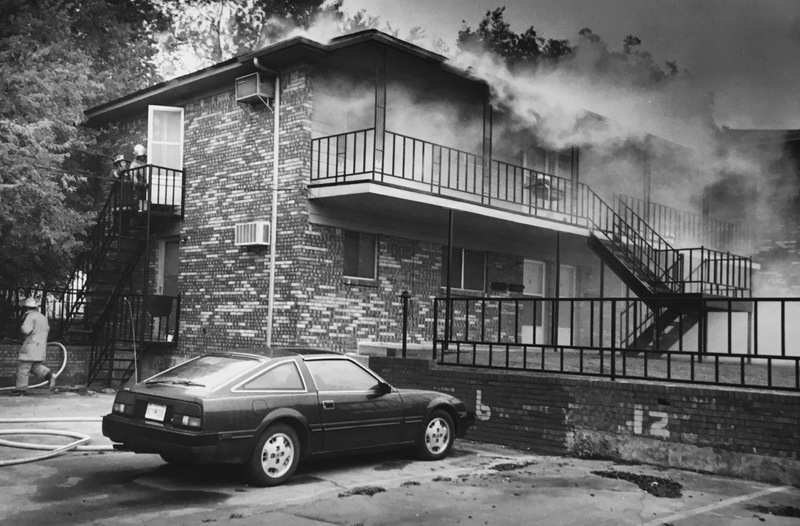 This is the blaze at my apartment complex in September 1995. You can see my parking space, 12, on the right side of the frame. No one was injured, and the building was repaired and reoccupied in a few months. I remember the Byng fire story, but wow, what a coincidence that it’s happened multiple times. I appreciate your lack of condemnation here. So often, when learning of mistakes like this, it’s very easy to shake our heads in disbelief and speak judgment on the person’s intelligence. He was a good guy and he felt terrible about it. It was an every day activity (making breakfast) and he left out one small step – turning off the burner. We all take all those little steps every day, and seldom make it through a day without missing something. It just happened that for him that day, it was a costly small step.